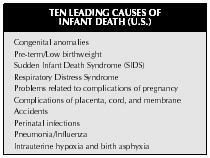 Sudden infant death syndrome (SIDS) is the term used to describe the sudden and unexplained death of an apparently healthy infant. This unpredictable and unpreventable phenomenon is the leading cause of death in babies less than one year old and strikes infants of all ethnic or economic backgrounds. Several theories exist but none can fully explain it or stop it from happening. The sudden death of a baby while sleeping, although tragic, is nothing new. It has a history of at least 2,000 years and is even mentioned in the Bible. In First Kings, the story is told of how King Solomon judged who was the real mother of a surviving child. The child's dead sibling was thought to have "died in the night because she overlaid it." "Overlaying" or the accidental suffocation of an infant by an adult who rolled on the baby while sleeping was for centuries thought to be the only reasonable explanation for an apparently healthy infant going peacefully to sleep and never waking up. In ancient Egypt, a mother who was judged to be responsible for doing this was sentenced to hold the dead infant for three days and nights. The first known medical textbook written during the second century A.D. by Greek physician Soranus of Ephesus instructs mothers and wet-nurses (female servants who were nursing or breast feeding their own child and who also would nurse the baby of their mistress or employer) never to sleep with infants in case they should accidentally fall asleep on the baby and somehow suffocate it. References to "overlaying" are known to exist throughout the centuries, and it appears again and again in church records and doctors' records. It is even found in records from the Plymouth colony in New England where it was called "stifling." The question of whether a baby had been killed deliberately by an adult was always in the background, and often authorities would have to judge the fate of parents whose healthy infant died suddenly and therefore suspiciously. Nineteenth-century doctors naturally tried to explain scientifically these sudden deaths of babies, and one of the first such explanations was that the infant suffered from some sort of respiratory ailment. By the beginning of the twentieth century, sleep apnea (pronounced AP-nee-uh), in which a baby stops breathing for some reason but does not start up again, was considered a cause. By the 1930s, the role of infection was being considered, and by the 1940s, most American mothers were no longer taking their children to bed with them for fear of accidentally smothering them. Hypoxia: A deficiency of oxygen reaching the tissues of the body. Source: Monthly Vital Statistical Report , 46, no. 1 Supplement, 1996.
of the medical history. These guidelines are still followed today. During 1972, the issue of SIDS received even more attention as the United States Congress held hearings on the subject and increased funding for research. Despite this history and attention, it is nonetheless still true that in the U.S., more children die of SIDS in one year than die of cancer, leukemia, heart disease, cystic fibrosis, and child abuse combined. SIDS is, therefore, the leading killer of children between one week and one year of age. What physicians know about SIDS is more of a description than a real understanding. They know that it occurs to infants up to one year old, but most often between the ages of two and four months. It occurs during sleep and strikes without warning. 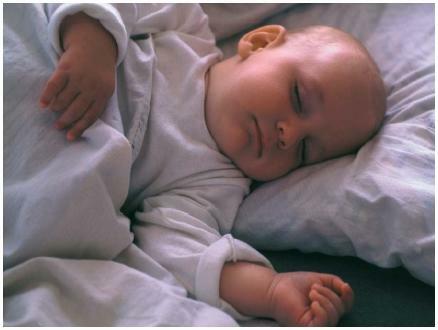 It may occur a few minutes after a baby is put down for the night or after sleeping all night. It has even happened to a sleeping baby in a parent's arms. It affects all types of children in all types of families, and has no relation to ethnicity or income level. However, for some reason, African-American infants die of it twice as often as white infants. Males babies are 50 percent more likely to die of SIDS than females, but neither parents nor doctors can tell which babies will die. Although no specific cause is yet known, researchers have put together a typical case of what does happen when SIDS strikes. They now believe that certain babies are more at risk than others, and that babies born with one or more conditions can make them especially vulnerable to the normal stresses that all babies experience. Some of these risk factors are stress caused by infection, a birth defect, or a failure to develop. Other factors that are believed to increase vulnerability are premature birth, low birth weight, a sibling who died of SIDS, or babies who have a twin. Other external factors that seem to matter include cigarette smoking or drug use by the mother during pregnancy as well as other medical complications she may have experienced while pregnant. Finally, statistics show that babies who are breast-fed are less likely to die suddenly than those who were bottle fed. The very number of these factors points out how little modern science knows about this syndrome. As to what causes SIDS, two major theories best exemplify the hundreds of theories already proposed. One of these says that SIDS happens to normal, healthy babies who have something go wrong with them because of the fact that they are developing so rapidly. This notion of SIDS as a developmental phenomenon argues that because a baby's brain is growing so quickly during its first six months, there is the possibility that it may send an abnormal or wrong message to a critical organ system. For example, it might tell the throat to "close off" instead of "open up" after a breath. The other major theory says that babies who die from SIDS were basically not healthy infants, and that some condition predisposed them to it. This idea says that the baby's developmental experience in the womb before it was born may have made it more at risk. Like the other theory, this theory also focuses on the brain, but argues that it is significant that many SIDS victims have subtle or minor brain abnormalities in the part of the brain that affects sleep. on the stomachs are more at risk than those who sleep on their backs. It is now standard practice for doctors to tell new parents that normal babies should sleep face up during the first six months of life. The death of any child is a terrible thing, but when it occurs with such suddenness and with no forewarning, it can be devastating to the survivors. Often, parents cannot rid themselves of guilt feelings that somehow they were to blame or that they could have done something to prevent it. Fortunately, there are many support groups available for both parents and siblings of a SIDS victim, many of whom feel so bad they become psychological victims themselves. With all the attention and research that SIDS is attracting, the rate of the syndrome may be falling. However, because SIDS is still so unpredictable, researchers must continue their work to seek a cause. Many believe that when SIDS is finally understood, it will have more than one simple explanation. We lost our Great Grandson Jayden 3 weeks ago @ age 10 mos. The ER Dr's were baffled as to what caused him to pass away after falling asleep about 3 hrs earlier. We are all devasted. I was a young mother @ 17 as was my Grandaughter. Jayden had lived most of his life in Corpus Christi,Texas, but had moved with his Mother to Beaverton,Oregon, to get away from an abusive father. The change in climate was dramatic, going from tropical to cold with snow. He'd been to the Dr the previous week for a runny nose, and they checked his lungs and said they were clear. The Dr said he just had allergies, which run in our family. My Daughter, Jayden's Grandmother had a touch of asthma as did the babies Mother, but as they grew older they appeared to grow out of it, however remained having allergies. Jayden's Mother had a venerial disease prior to her pregnacy also. She lived with the Jayden's father and his mother who smoked in the house and car around the baby. I was very blunt to them on many occasions concerning this, however they appeared oblivious to what I was telling them due to their ignorance. Jayden's father and his mother went to the media in Corpus making accusations that perhaps my Grandaughter or her Father had done something to cause the babies death. This has made us have to grieve and suffer the accusations all the while. The preliminary test results have found nothing, however we are still waiting for the toxicology report to come back anytime now. Meanwhile, we have recently moved to Fayetteville,Arkansas, and there are no support groups here whatsoever. I plan to get involved in some sort of counseling for myself, after the holidays. Jayden, had lived with us the first few months of his life, and I loved him like my own. He will be dearly missed, he was a sweet & beautiful little boy. Please let me know of any services available for support in losing an infant. Thank you & God bless. Its so sad to think about how many babeis die from SIDS. Its even sadder to think how many of them could have been prevented if only the parents knew these things. You would think it would be required for hospitals to give this information to parents before they leave the hospital.